“Why are Islam and Christianity so much bothered with religious conversion while religions like Hinduism are not?” A young White woman posed me this question after I had finished speaking in a conference abroad. The theme was ‘hatred in the name of religion’. She said she was an American and the daughter of a missionary who lived in India in a tribal area. “I have spent my childhood there and now am a student of ‘philosophy and religion’. I wondered how to answer her. “To me both Christianity and Islam are religions which from the very inception have lived with the fear that they might become extinct one day while Hinduism has no such fear. Perhaps that is why they are forever trying to increase their number of followers by converting people.” To my surprise she agreed and told me she feels the same. “It is unusual for the daughter of a missionary who has been converting people to say so,” I said. “Your question to me, where is it coming from?” I asked. She said she had read the book ‘Things fall apart’ many times. I told her about Kashmiri Pandits and I am writing a book on trauma around religion in India. Then exchanging e-mails, we parted. However much Muslims and Christians today fight in other parts of the world, they agree on one thing. It is that Hindus represent the largest group untouched by their conversion and it is their last opportunity to make them followers. This continues with countries like Pakistan leading the path. Like their Christian counterparts, imams of Pakistan also have to present their figures to their masters sitting in Saudi Arabia with petro-dollars. And they too have a fear that if they don’t increase the number of their followers, their religion may become extinct unable to face the challenges of modernity. Hinduism doesn’t force others to convert. It has never done so. It is because of its philosophy of ‘advaita’. It had no fear for its extinction. But will it last in the present times? The very basic postulate of Hinduism that there is no separate god who rules over the universe with punishment, but one who is the ultimate reality himself embracing us all gives it an identity that makes it without fear. Identifying with that identity has made Hindus in a different mold. They never ran and looked for converts but embraced every other faith. But has the time come for the Hindus to become assertive and protect their dharma? What can we say today about why religious conversion exists, what it has done to the human condition, what it has achieved and if has added up to anything in mankind? I believe it can be summed up in three words called the ‘dread of insignificance’. It comes from identifying with a terrifying, punishing God and even the idea of a heaven full of rivers of milk and honey, a purgatory hell that burns you if you have been disobedient. It is this belief in dharma that imams or missionaries face it when they try to convert Hindus. The imam who forced the two young girls in Pakistan or the missionary sent by the Church from America both have the same fear. They both battle with their ‘dread of insignificance’ if they don’t convert and their own fear that without conversion their religious life is directionless and will cease to have any meaning. How do the Hindus need to view religious conversion by Muslims and Christians? They need to see it in two ways. First as a human genocide in human history that has robbed millions of us in every age of our identity and campaigning for its eradication. The second is to see it as a fear of survival of those propagating the Abrahamic religions, their belief that it is for self perpetuation through their religion, guarantying them their salvation from a punishing god and a purgatory hell. In seeking to destroy evil through conversion, Abrahamic religions have brought million times more evil for which today there is no return back. Every convert gets filled with hate towards his previous religion because now he hates himself for paying obeisance to a new god who does not allow him to embrace anyone else but himself. Hindu girls in Pakistan carry two distinct identities at the same time. One that of a woman in a conservative society and the other to carry on the tag of an infidel in a society that was born out of a belief of no co-existence with ‘kafirs’. So till the number of infidel women is reduced to zero, the nation will not be said to achieve the ‘final solution’. 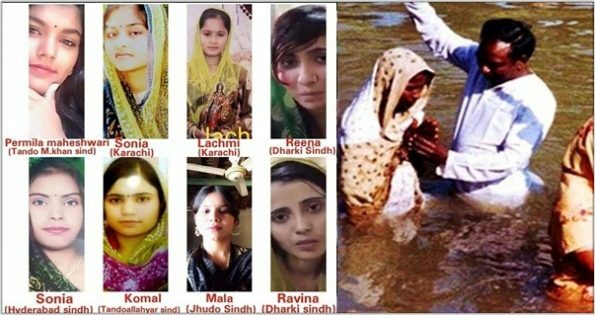 The case of the Hindu girls converted in Pakistan and all the millions of hapless people converted in every era of history have only one message for those who didn’t. It is that ideologies that see God as an all punishing one separate from the universe will not tolerate any other to co-exist. Till then religious conversions will continue to bound and chain mankind planting seeds of hatred. The answer lies in realizing that the very redemption of those who try to convert others in the name of their religion will only be borne by their children to account for the sins of their ancestors. Featured image courtesy (for representation purpose): Facebook and The Tiny Man.